All colors ink your design are printed using a 4 color process. Orders are manufactured within 5 business days. If you order 500 pads or more and are in a rush, you can select to have your order manufactured within 4 business days, 3 business days, or 2 business days. There is an upcharge for for rush production. Superior quality Bic USA shaped sticky notes. You can design your USA shaped sticky notepads online in our design studio using our online templates or you can upload a sticky pad design you created offline. 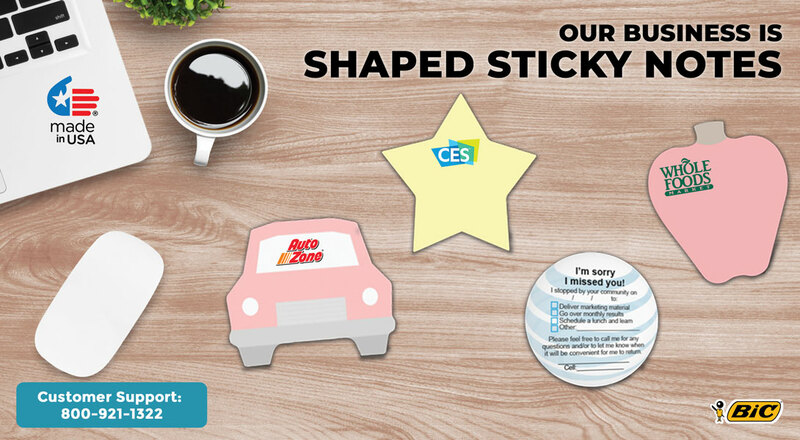 You have full access to our image library so you can design a sticky note to fit any occasion. Use the product calculator on the left to see our standard customization options. 25, 50 or 100 sheets per pad. Imprint is on every sheet. This is bound on the top side. Print your sticky note in full color. Standard sticky note adhesive paper. Final cut size is 3.72 inches wide and 2.75 inches high. 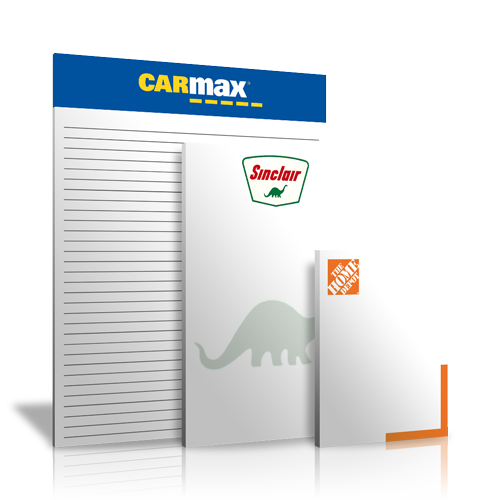 The Personalized Paper website is an interactive website that we have designed to allow our customers to customize products online without the need to hire a graphic designer. As part of the customization process, you will need to select options and read instructions if you are not familiar with basic product design. If you get stuck on how to perform a function, we provide easy to understand instructions throughout the design and ordering process. So let’s get started! First, complete Steps 1 thru 3 in the pricing calculator found on the left side of this page. Step 1: Select the quantity and size/sheets you wish to order. 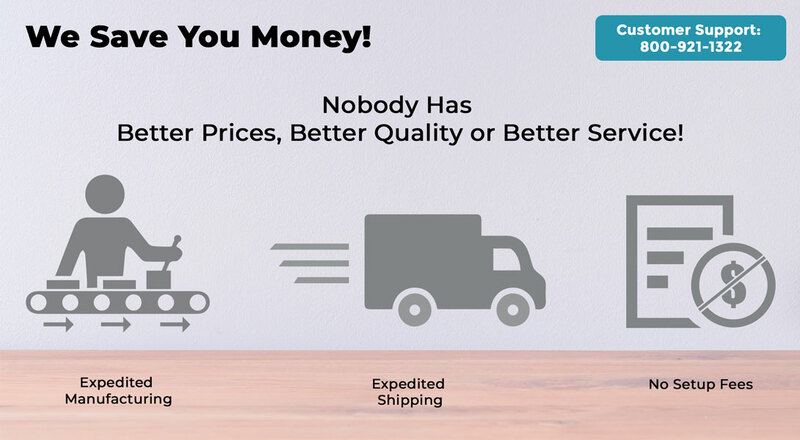 We feature quantity pricing where the more you buy, the less the price. Step 2: Click on the STEP 2 button and select the options for your product. Step 3: Click on the STEP 3 button to be taken to the design options page, where you can select from several options on how you prefer to get your design to us. Step 4: You will be taken to our design studio. In the design studio you can add an unlimited amount of text and images. If you do not have the skills to create a product, we provide detailed easy to understand instructions to assist you. After you design your product, we provide you will a free PDF proof so you can review your design for accuracy. Step 5: When satisfied with the product you have created, start the checkout process by creating an account. Step 6: Review and complete your order using our secure checkout. Please note that we do not take orders over the telephone nor can we walk you through an online order. The instructions and process is designed to be easy if you follow basic instructions. Our experienced customer support team is available to answer questions by calling (800)921-1322. 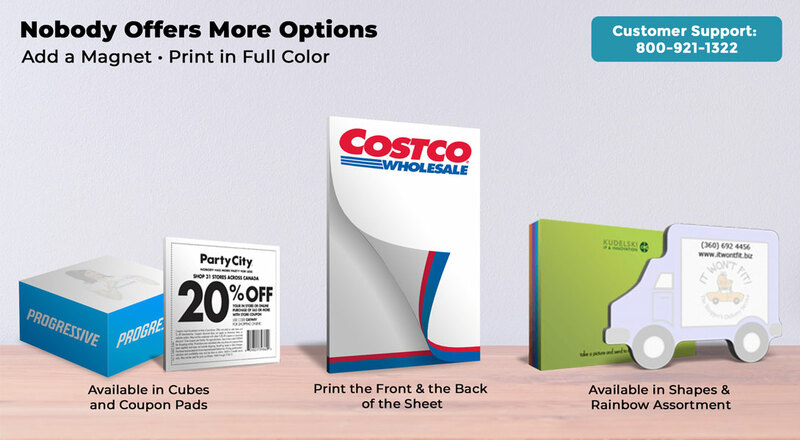 Prior to purchasing any product from Printpps.com, customers are able to preview a proof online before checkout. If you uploaded your own design, the file you uploaded is your proof because we print from the file you provide. 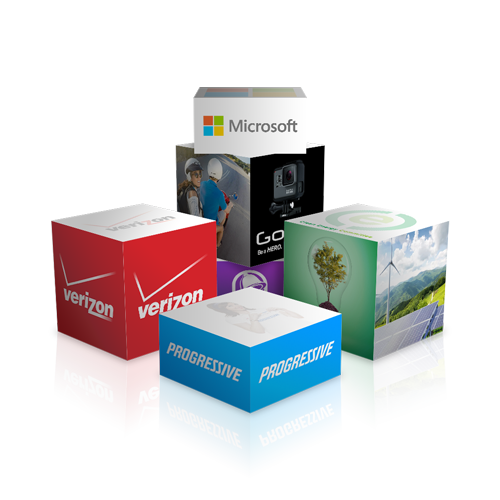 We print millions of custom products annually and our customers are delighted with the products we provide. However, on rare occasions, customers have very specific color, formatting, and registration requirements. The only way to determine if the product you are ordering matches your specific color, formatting, and registration requirements, is for you to pay for an actual printed proof and see if the actual printed product matches your specifications. PrintPPS.com will be happy to send you a printed proof for a non-refundable charge of $33.00. Personalized Paper Manufacturing Group’s pricing is based off “Quantity Pricing”, where by increasing your total quantity lowers your cost per individual product. The only pricing we have available is the pricing shown in the pricing calculator. Orders are manufactured and shipped within 5 business days. If you are in a rush, you can select to have your order shipped within 4 business days, 3 business days, or 2 business days. There is an upcharge for for rush production and shipping. NOTE: The ship date you select is not when your order will arrive at your location. WHEN WILL MY ORDER ARRIVE AT MY LOCATION (IN TRANSIT TIME)? FedEx Ground-Arrives within 3 to 5 business days from date of shipping. FedEx 3rd Day Air-Arrives in 3 business days from date of shipping. FedEx 2nd Day Air-Arrives in 2 business days from date of shipping. FedEx Next Day Air-Arrives in one business day from date of shipping. U.S. Post Office-Arrives in 3 to 7 business days from the date of shipping. FedEx International Economy-Arrives within 3 to 5 business days from the date of shipping. FedEx International Priority-Arrives in 1 to 3 business days from the date of shipping. • Accepted File Types: Print Quality PDF (recommended), jpeg, jpg, png, ai, eps, or psd. Convert Microsoft Word, Publisher, Powerpoint or Excel files to a Print Quality PDF. • Bleeds: Please follow the instructions below if you selected to have a bleed on your Custom Sticky Note order. • Margins: We require a ¼ inch margin if your product does not have a bleed. • Ink Coverage: If your pad has over 15% ink coverage (not including watermarks), please go to the business forms category to place your order, where ink coverage greater than 15% has been accounted for in the product. • Scale to Size: If you are “Submitting a Design” you created offline, please ensure the file size you are submitting is the exact size of the product you wish to order. 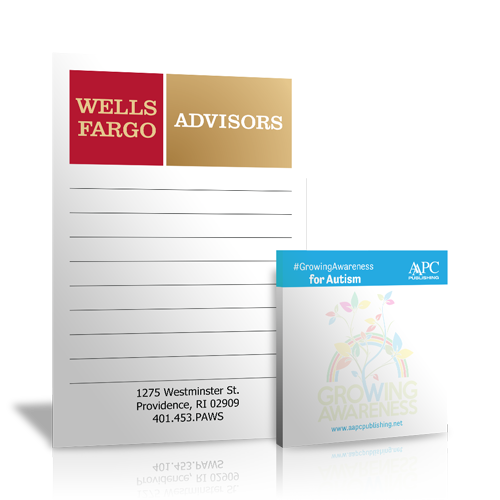 Personalized Paper Manufacturing Group is a proud member of The Julmark Group of Companies. The Julmark Group has been active in the manufacturing and distribution of quality stationery products since 1996. All Julmark divisions focus on a primary mission of providing superior quality products...at unbeatable prices...coupled with outstanding service. The Personalized Paper Manufacturing Group division has its corporate headquarters in Albuquerque, New Mexico. We have manufacturing facilities in Albuquerque, New Mexico and Clearwater, Florida.